Tantrums are a normal part of growing up as children start to assert their independence and learn how to express emotions. Teach your child that anger is a common feeling and how to express it constructively. Teach children that they can get your attention with good behavior instead of seeking negative attention. Temper tantrums can leave you feeling frustrated, embarrassed, and helpless. It is helpful to step back and remember that tantrums are a normal part of growing up as children start to assert their independence and learn how to express emotions. Once you understand the reasons behind the tantrums, there are things you can do to avoid tantrums and help your child through this stage. First, it is important to understand the stage your child is in and how that affects behavior. Tantrums are common in children ages one to four and vary depending on the age and temperament of the child. Test limits to see how much you will let them get away with. Have trouble seeing from another’s point of view. Feel a heightened need for independence. Show anger or frustration by biting, crying, arguing, hitting, screaming, kicking, or breath holding. Are difficult to reason with during a temper tantrum — reasoning or arguing only intensifies the tantrum. Rely less on tantrums to communicate needs and emotions as they become more skilled at using language. Still use temper tantrums if doing so gets them what they want. Rely less on adults to meet their needs as their motor and physical skills improve. Are able to problem solve and compromise. Still experience temper tantrums in response to difficult academic tasks and new social demands in school. Now that you understand why children have tantrums, the next step is to avoid them. Once a temper tantrum starts, it is hard to derail, so the best bet is to try to prevent them. Praise children when they are being good. Teach them that they don’t need to seek negative attention, but that they can get your attention with good behavior. Give children the opportunity to make choices. Giving a child the ability to choose which pajamas to wear now can help you avoid a big power struggle later. Distract children with another activity when you sense a tantrum coming. Make sure your child is well-rested and not hungry. This will help your child better handle difficult situations and therefore, be less likely to have a tantrum. Unfortunately, you can’t prevent every tantrum, so how do you manage a tantrum when it does happen? Stay calm and think before you act. Spanking or yelling rarely works. Don’t give in. This will only increase tantrums in the future. At the beginning of the tantrum, help the child go to a quiet place where he can calm down and think about what would be the appropriate thing to do next. If the tantrum is being used to get your attention, ignore the tantrum and give your attention once the child calms down. If you are afraid that the child will hurt herself or someone else, hold the child and tell her you will let go as soon as she calms down. Let the child know that you love her and that everything will be all right. If the tantrum escalates beyond intervention, place your child in time-out. If you are away from home, this can be outside or in the car. Time-out should last no more than one minute for each year of age. After the tantrum, there are things you can do to help your child feel loved and help teach them how to avoid tantrums in the future. Talk with your child afterward about appropriate ways to get what he wants, and how to deal with frustration when he can’t have his way. If possible, try to help him solve the problem. Help your child learn empathy for others. Let your child know that you love her. 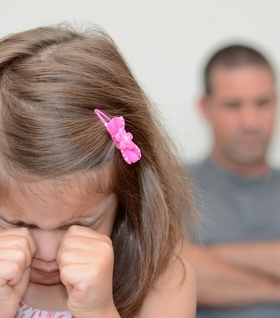 Don’t let the tantrum taint your good relationship with your child. Do not reward your child for calming down or you risk teaching him that a tantrum is a good way of getting something later. If despite your intervention, your child’s tantrums are increasing in frequency, intensity or duration, talk to your child’s pediatrician. You should also consult your pediatrician if your child displays mood disorders such as negativity, low self-esteem, extreme dependence, or is older than four and is still having tantrums. Your pediatrician will look for physical or psychological problems that may be causing the tantrums and will be able to give you additional tips. In the meantime, it helps to keep things in perspective during this difficult stage. Just like colic, middle-of-the-night awakenings and spit up, this too will pass as your child matures. But unfortunately, so will their adorable little lisp, their tottering steps and their cute little dimples.